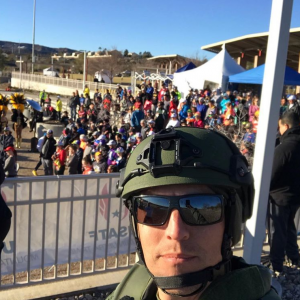 HENDERSON, Nev — A California police officer is raising money for the Richardson officer who died in the line of duty last year, by running 100 miles decked out in SWAT gear. Officer Chris Collier is with the Carlsbad Police Department in Southern California and ran the full 100 miles over the weekend in Nevada as part of the Jackpot Ultra Running Festival. He says the SWAT vest, helmet, and gas mask in his pouch weighs about 21 pounds. A Go-Fund-Me page is still up and taking donations for Richardson officer David Sherrard and his family, who Collier knew. As of Monday morning, the page had raised $6,415 of the $10,000 goal. Collier says on the page all the money raised will go toward the family.